The Brown Snake Eagle (Circaetus cinereus) is a species of bird of prey in the Accipitridae family. It is found throughout sub-Saharan Africa. The Lilac-breasted Roller (Coracias caudatus) is a member of the roller family of birds. It is widely distributed in sub-Saharan Africa and the southern Arabian Peninsula, preferring open woodland and savanna; it is largely absent from treeless places. Usually found alone or in pairs, it perches conspicuously at the tops of trees, poles or other high vantage points from where it can spot insects, lizards, scorpions, snails, small birds and rodents moving about at ground level. Nesting takes place in a natural hole in a tree where a clutch of 2–4 eggs is laid, and incubated by both parents, who are extremely aggressive in defence of their nest, taking on raptors and other birds. During the breeding season the male will rise to great heights, descending in swoops and dives, while uttering harsh, discordant cries. The sexes are alike in coloration. Juveniles do not have the long tail feathers that adults do. This species is the national bird of Botswana and Kenya. The Palm Cockatoo (Probosciger aterrimus), also known as the Goliath Cockatoo or Great Black Cockatoo, is a large smoky-grey or black parrot of the cockatoo family native to New Guinea and far north Queensland, Australia. It has a very large black beak and prominent red cheek patches. The bird was also called Goliath Aratoo in Wood’s Natural History (1862). The Palm Cockatoo is 55 to 60 cm (22 to 24 in) in length and weighs 910–1,200 g (2.0–2.6 lb). It may be the largest cockatoo species and largest parrot in Australia, although large races of Yellow-tailed Black Cockatoos and Sulphur-crested Cockatoos broadly overlap in size. It is a distinctive bird with a large crest and has one of the largest bills of any parrot (only the Hyacinth Macaw’s is larger). This powerful bill enables Palm Cockatoos not only to eat very hard nutsand seeds, but it also enables males to break off thick (~1″) sticks from live trees to use for a drumming display (Wood 1984). The male has a larger beak than the female. The bill is unusual as the lower and upper mandibles do not meet for much of its length, allowing the tongue to hold a nut against the top mandible while the lower mandible works to open it. The Palm Cockatoo also has a distinctive red cheek patch that changes colour when the bird is alarmed or excited. The Palm Cockatoo has a large and complex vocal repertoire, including many whistles and even a “hello” call that sounds surprisingly human-like. There are distinct dialects throughout the species’ range. There is anecdotal evidence of a Palm Cockatoo reaching 80 or 90 years of age in an Australian zoo, although the oldest confirmed individual was aged 56 in London Zoo in 2000. Although longevity of captive birds is known, it is still unknown how long palm cockatoos live in the wild. He later (in litt.) asserted that the name was a lapsus (Salomonsen, American Mus. Novitates No. 1991 (1960)). However, melanostigma continued to be cited in various lists (Howard and Moore, Complete Checklist of the Birds of the World (1980, 1991)), as well as on websites which list birds common to Thailand and the surrounding region, thus possibly allowing for the inadvertent description of this name should any published reference to it accompany a picture of an orange-bellied flowerpecker. Dickinson (Complete Howard and Moore Checklist (2003)) also asserted that the name was a lapsus, but of Howard and Moore’s, with no reference to Delacour. The Plate-billed Mountain Toucan (Andigena laminirostris) is a species of bird in the family Ramphastidae. It is native to Colombia and Ecuador, where it occurs in the high-altitude humid montane forests of the Andes. It is one of five species in genusAndigena, the mountain toucans. Other common names include Plain-billed Mountain-toucan, Laminated Mountain-toucan, and Hill-toucan in English, Toucan montagnard in French, Leistenschnabeltukan in German, and Tucán Piquiplano in Spanish. The Plate-Billed Mountain Toucan is about 42 to 53 centimeters (16.5 to 21 inches) in length, with a relatively lightweight bill up to 10 centimeters long. The average male weighs about 314 grams (11.1 ounces) and the female about 303 grams (10.7 ounces). It is zygodactylous, with two toes forward and two pointing back. The Pied-billed Grebe (Podilymbus podiceps) is a species of the grebe family of water birds. Since the Atitlán Grebe (Podilymbus gigas) has become extinct, it is the sole extant member of the genus Podilymbus. The Pied-billed Grebe is primarily found in ponds throughout the Americas. Other names of this grebe include American dabchick, dabchick, Carolina grebe, devil-diver, dive-dapper, dipper, hell-diver, pied-billed dabchick, thick-billed grebe, and water witch. Pied-billed Grebes are small, stocky, and short-necked. They are 31–38 cm (12–15 in) in length, with a wingspan of 45–62 cm (18–24 in) and weigh 253–568 g (8.9–20.0 oz). They are mainly brown, with a darker crown and back. Their brown color serves as camouflage in the marshes they live in. They do not have white under their wings when flying, like other grebes. Their undertail is white and they have a short, blunt chicken-like bill that is a light grey color, which in summer is encircled by a broad black band (hence the name). In the summer, its throat is black. There is no sexual dimorphism. Juveniles have black and white stripes and look more like winter adults. This grebe does not have webbed feet. Its toes havelobes that come out of the side of each toe. These lobes allow for easy paddling. When flying, the feet appear behind the body due to the feet’s placement in the far back of the body. It may be confused with the Least Grebe, although that species is smaller and has a thinner bill. The Blackburnian Warbler (Setophaga fusca) is a small New World warbler. They breed in eastern North America, from southern Canada, westwards to the southern Canadian Prairies, the Great Lakes region and New England, to North Carolina. Blackburnian Warblers are migratory, wintering in southern Central America and in South America, and are very rare vagrants to western Europe. These birds were named after Anna Blackburne, an English botanist. Blackburnian Warblers are around 11 to 13 cm (4.3 to 5.1 in) long, with a 20 to 22 cm (7.9 to 8.7 in) wingspan, and weigh 8 to 13 g (0.28 to 0.46 oz). The average mass of an adult bird is 9.7 g (0.34 oz). Among standard measurements, the wing chord is 6.3 to 7.3 cm (2.5 to 2.9 in), the tail is 4.2 to 5 cm (1.7 to 2.0 in), the bill is 0.9 to 1 cm (0.35 to 0.39 in) and the tarsus is 1.6 to 1.8 cm (0.63 to 0.71 in). In summer, male Blackburnian Warblers display dark gray backs and double white wing bars, with yellowish rumps and dark brown crowns. The underparts of these birds are white, and are tinged with yellow and streaked black. The head is strongly patterned in yellow and black, with a flaming-orange throat. It is the only North American warbler with this striking plumage. Other plumages, including the fall male and adult female, are washed-out versions of the summer male, and in particular lack the bright colors and strong head pattern. Basic plumages show weaker yellows and gray in place of black in the breeding male. Blackburnian Warblers’ songs are a simple series of high swi notes, which often ascend in pitch. Their call is a high sip. The Black-breasted Puffleg (Eriocnemis nigrivestis) is a rather small (8.5 cm in length) species of hummingbird endemic to Ecuador. It has a very restricted range, being found only on the Northwestern slopes of the Pichincha volcano and it is critically endangered. On the 23rd of June, 2005 this bird was adopted as the emblem of the city of Quito, which, being just on the other side of the volcano, is very close to where the last populations of the species are found. The Northern Red Bishop or Orange Bishop (Euplectes franciscanus) is a weaver belonging to the family Ploceidae. It was formerly regarded as a subspecies of the Southern Red Bishop (Euplectes orix) of the southern half of Africa. The two are now usually classified as separate species. The Northern Red Bishop is a stocky 13–15 cm. bird. The breeding male is scarlet apart from his black head and waistcoat, and brown wings and tail. The conical bill is thick and black. The non-breeding male is pale yellow streaked above and shading to whitish below. It has a buff supercilium. Females are similar, but smaller. Young birds have wider pale fringes on their flight feathers. The Northern Red Bishop is a resident breeding bird species in Africa south of the Sahara Desert and north of the Equator. It has been introduced to Puerto Rico, Martinique and Guadeloupe in the West Indies. This common weaver occurs in a range of open country, especially tall grassland and often near water. 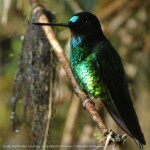 The Dusky Starfrontlet (Coeligena orina) is a hummingbird species in the subfamily Trochilinae. It is found only at high altitudes in the Cordillera Occidental of Colombia, and was first discovered on Páramo de Frontino. Its status was mysterious for a long time as it was only known from a few museum specimens; it was often held to be a mutant or color morph of some other species of Coeligena. When it was rediscovered in 2004, in what is now the Colibri del Sol Bird Reserve, its status as a distinct species was confirmed. Although this bird was listed as a species of Least Concern in the IUCN Red List for many years, it became evident that it was close to extinction, and its status was upgraded to Critically Endangered in the 2007 Red List issue.